It is that time of the year again when we throw bashes and play trick-or-treats. It's Halloween and each one of us would already have started planning parties and sending out Halloween party invitations for the same is the foremost thing to do. Getting together for a party is something which everyone likes, and if it is Halloween, we know that it is going to be all the more fun. So, start with designing party invitations by using Greeting Card Studio and invite all. You can design amazing, scary invitations for the Halloween party using Greeting Card Studio and instill excitement among the guests list. Using this greeting card software to design Halloween invitations is the easiest thing to do. This software comes with an easy-to-use intuitive card creating interface and making cards of all sorts is as easy as it sounds. This software has innumerable symbols, and you can choose from attractive, spooky symbols to insert in your card. Making Halloween party cards look interesting customized is quite easy with the use of this software. The tradition of trick-or-treat is still there but there is something great about giving a card on this occasion too, like any other festivity. Halloween is the greatest occasion and every one of us celebrates it with elation. Therefore, giving away customized Halloween cards is a great idea. You can also use the templates provided in Greeting Card Studio and design amazing cards for Halloween with no extra time or effort. You just have to select a greeting card template of your choice and edit it accordingly. You can insert scary shapes and symbols for Halloween and put images too. You can import images from your local system to put in your card. Besides, you can edit the text as required and choose your own fonts and colors. You can add scary messages by inserting callouts and basic shapes to your card design. You can also use complete card editing tools to edit, crop, flip or rotate your card. It is on this occasion that we spend a huge amount of money on buying cards from the market. However, if you have this Greeting Card Studio card maker software, you can save on that money and design cards on your own. 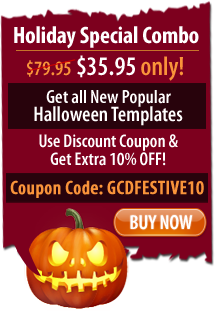 This software will make your Halloween cards creation simpler and less time consuming. You can create personalized cards with this software for various occasions. Apart from cards and invitations, you can also design announcements, posters and other pieces of communication.